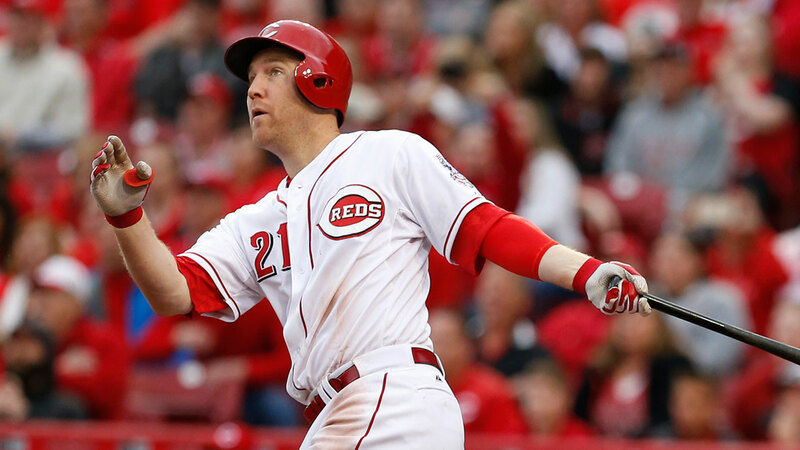 Frazier batted .255 with 35 home runs with the Reds last season. The Chicago White Sox have just acquired Todd Frazier from the Cincinnati Reds in a three team trade involving the Dodgers. The Reds will receive middle infielder/outfielder Jose Peraza, infielder Brandon Dixon, and outfielder Scott Schebler from the Dodgers. The White Sox will give away pitcher Frankie Montas, infielder Micah Johnson and outfielder Trayce Thompson to the Dodgers. Frazier has hit 64 home runs in his last two season, both resulted in All Star appearances. He is now only 29 and has arguably become better each season. Though Frazier has been arguably one of the better hitters in the national league the last couple of season, there is some concern with his home-road splits. The Reds home field, Great American Ballpark, is one of the hitter-friendliest ballparks in the game. Frazier did only hit three more home runs at home (19-16), but his average was .278 at home compare to .233 on the road. Frazier also had a terrible second half last year, posting a .220/.274/.390 slash with only 10 home runs. This move will most likely move the White Sox’s recently acquired 3B Brett Lawrie to second. Though Frazier does have some experience in the corner outfield positions in the minors and that could be a longshot option for the ChiSox. In return, the Reds will be getting a lot from the Dodgers. The first player is Jose Peraza, a 21 year old, versatile, lightning fast top prospect(#54 prospect from Baseball American and #38 for mlb.com). Peraza combined for 33 stolen bases last year for the Braves and Dodgers triple-A affiliate and 60 in double-A the year before. Secondly, the Dodgers cough up Brandon Dixon, a third round pick by the Dodgers back in 2013. Dixon has yet to develop in the minors, slashing .244/.275/.375 in AA last year; but Dixon could develop into a solid player with decent power (19 home runs in 128 games in 2014) and good speed (16 stolen bases in 88 games). Lastly the Dodgers give up OF Scott Schebler, a 25 year old, 26th round pick from 2010 who played in his first 19 MLB games last year with LA. He projects to only be a solid platoon/bench player with decent enough power but not much else. The Dodgers in return will get three players, all from Chicago. Frankie Montas, one of the three players, is the #91 rated prospect according to mlb.com and for good reason. At 22 years old, he posted a 2.97 era in 23 starts in double-A for the Sox before getting an early call up to the pros. Montas clearly wasn’t ready, posting a 4.80 era in 7 games (2 starts) and 15.0 innings. Secondly, LA gets IF Micah Johnson. Johnson is a high average, high stolen base guy who batted .315 in AAA last year with 28 bags swiped in 78 games. He struggled mightily upon getting called up though, batting .238 with 3 steals in 5 attempts in 36 games. There still is plenty of upside with the 24 year old, and he could be seen manning second base for the Dodgers in the near future. Lastly, the Dodgers get the brother Golden State Warrior’s Klay Thompson, Trayce Thompson. The second round pick was awful in the minors, batting .241/.319/.429 over seven seasons in the White Sox’s farm system. But Thompson did turn it around upon being called up to the majors, batting .295 with 5 homers in 44 games with the club. Thompson most likely pans out to being only a bench player, but he could be a solid bat to backup the Dodger’s outfield. This deal helps make the White Sox relevant again, but there still are a lot of ifs on their team from Melky Cabrera, Adam LaRoche, and Carlos Rodon. If things pan out their way, the White Sox could be in contention come next September. Posted in Chicago White Sox, Cincinnati Reds, Los Angeles Dodgers, MLB and tagged chicago, dodgers, frazier, reds, todd, white sox.